City in the department of Gard, France. A somewhat important Jewish community was founded here as early as the beginning of the twelfth century, whose members lived among the Christians and enjoyed the same rights and privileges as they did. In particular were they protected by the count of Toulouse, Raymond V., who admitted them to certain offices and entrusted them with an important part of the public administration. About 1195 they were persecuted, and many of them perished. In 1294 Philip the Fair ordered the seneschal to relegate them to the rampart which separated the city from the castle. This special quarter extended from the rock of Roquecourbe to the gate of Cancel; it disappeared entirely in 1578, together with the ruins of the synagogue, at the general demolition which Fouquet de Tholon, seigneur of Ste. Jaille, undertook in order to isolate the fortress which he was besieging. In 1295 all the Jews under the jurisdiction of the seneschal's court of Beaucaire were arrested, and the richest among them sent to the Châtelet at Paris. At the same time all their possessions were seized, and the prisoners were released only after having paid a considerable ransom and stated the amount of their credit (Ménard, "Histoire de Nîsmes," i. 412; idem, "Preuves," p. 125). In distributing the assessment of 150,000 livres, which Charles IV. 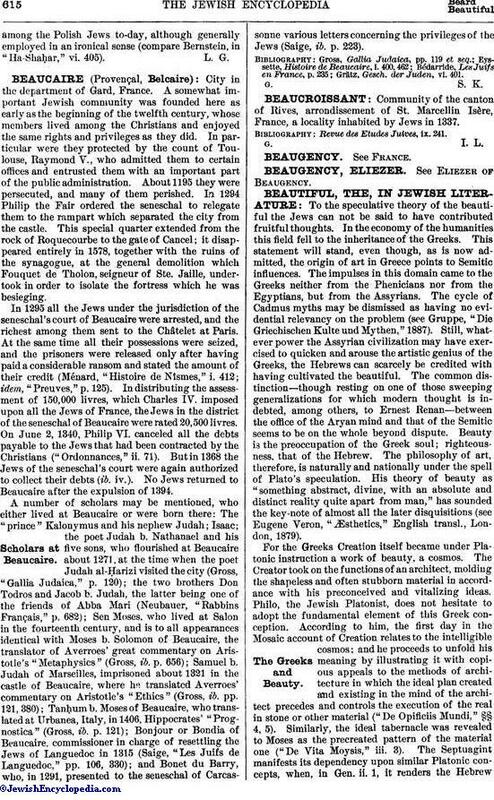 imposed upon all the Jews of France, the Jews in the district of the seneschal of Beaucaire were rated 20,500 livres. On June 2, 1340, Philip VI. canceled all the debts payable to the Jews that had been contracted by the Christians ("Ordonnances," ii. 71). But in 1368 the Jews of the seneschal's court were again authorized to collect their debts (ib. iv.). No Jews returned to Beaucaire after the expulsion of 1394. A number of scholars may be mentioned, who either lived at Beaucaire or were born there: The "prince" Kalonymus and his nephew Judah; Isaac; the poet Judah b. Nathanael and his five sons, who flourished at Beaucaire about 1271, at the time when the poet Judah al-Ḥarizi visited the city (Gross, "Gallia Judaica," p. 120); the two brothers Don Todros and Jacob b. Judah, the latter being one of the friends of Abba Mari (Neubauer, "Rabbins Français," p. 682); Sen Moses, who lived at Salon in the fourteenth century, and is to all appearances identical with Moses b. Solomon of Beaucaire, the translator of Averroes' great commentary on Aristotle's "Metaphysics" (Gross, ib. p. 656); Samuel b. Judah of Marseilles, imprisoned about 1321 in the castle of Beaucaire, where he translated Averroes' commentary on Aristotle's "Ethics" (Gross, ib. pp. 121, 380); Tanḥum b. Moses of Beaucaire, who translated at Urbanea, Italy, in 1406, Hippocrates' "Prognostica" (Gross, ib. p. 121); Bonjour or Bondia of Beaucaire, commissioner in charge of resettling the Jews of Languedoc in 1315 (Saige, "Les Juifs de Languedoc," pp. 106, 330); and Bonet du Barry, who, in 1291, presented to the seneschal of Carcassonne various letters concerning the privileges of the Jews (Saige, ib. p. 223). Grätz, Gesch. der Juden, vi. 401.